Alligator Goes To College, Doesn’t Get Past Parking Lot! The 21 year old pupil thought that it would be a great idea to spice up the presentation of his research paper about alligators to bring along a live gator as a prop. He never made it to the schoolroom to show off his alpha predator pet, since he passed out over the steering wheel in the college’s parking lot that morning. When campus officers responded to concerns that he had been unconscious in the car for hours, they discovered the huge alligator in the back seat of the vehicle. Thankfully no one was injured by the creature, and it was fortunate that the animal’s owner shut the gator’s mouth with a zip tie and several rubber bands. The local Wildlife department has custody of the alligator, and the student has been arrested on several marijuana and prescription drug related charges and could be fined for owning an alligator in the state of Oklahoma without a license. The man claims to have borrowed the gator from a friend who has at least two other alligators without the proper exotic animal license. 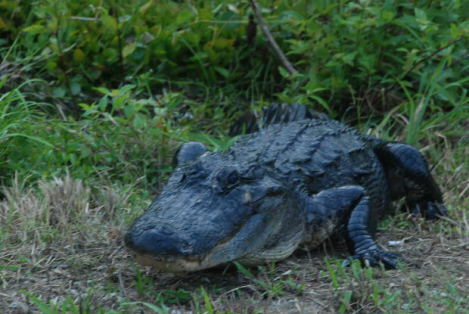 American alligators can grow up to a length between 10 and 15 feet and can weigh over 1,000 lbs. These carnivorous reptiles are a common sight throughout the southeastern United States, particularly Florida and Louisiana.